Cleartone Heavy Series are designed for people that play hard. 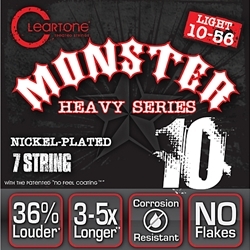 Made by Cleartone, the leader in premium guitar strings. With heavy-duty reinforced construction and enhanced core-to-wrap ratios, Cleartone Heavy Series are designed to be more powerful in every aspect. All six strings have the patented Cleartone VolumeBOOST treatement, which makes your strings up to 10% louder than uncoated sets and 36% louder than the leading coated set. Your new set of Cleartone Strings also feature our ToneLOCK technology to keep your strings sounding brand new up to 5 times longer. Owned by Rock and Roll legend Phil Everly.